August is the end of the summer for many of you; for us in San Francisco, it’s usually the beginning of the nicest few months of weather. So I wanted to make mention of that; I’ve included two songs – All Summer, a remix by Converse (yep, the shoe people) and Sleep All Summer, a glorious duet between Annie Clark (St. Vincent) and The National that makes me weep with delight. The general vibe of the mix is pretty upbeat – I challenge you to find something poppier and catchier than the new potty-mouthed Cee-Lo song ‘F*ck You’ – but there’s also some slower, more orchestral tracks, like The Walkmen’s first single – Stranded – off their upcoming album. My favorite physician-turned-design junkie, Jay Parkinson, turned me on to the new Menomena album, which I HIGHLY urge you all to get. He’s right – it’s going to be one of the best of the year. And we know my obsession with The National; You Were a Kindness is the yet unreleased single that was included in a live in-studio session in Minneapolis. (I love it so much I transcribed all the lyrics. Is there anything more tragic yet gloriously authentic than admitting that you’re a ‘confident wreck’? Methinks no.) By the time I release these mixes, I’m usually sick of the songs on them; this month, however, I’ve been playing it on repeat. Download it yourself and hopefully you’ll feel the same way. 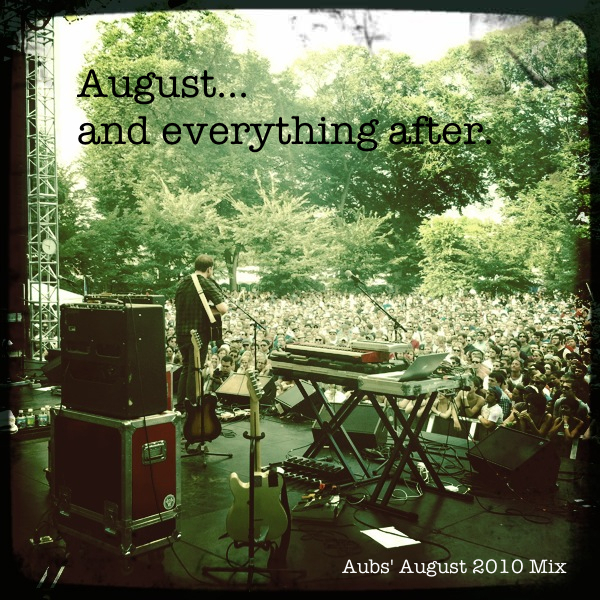 PS: That awesome photo that serves as this month’s album art was taken from sidestage at Lollapalooza. It’s Scott of Frightened Rabbit singing an acoustic version of Poke, which gives me chillbumps everytime I think of it. Aww. I had “West Coast” on repeat play not that long ago it seems.. actually might be fitting again.